I was invited to a house-warming party recently for a young couple. The invitation said, “no gifts.”. Not knowing what style the house was and not having a lot of time, I decided that a bottle of wine never goes to waste! In addition, I had some T Shirts to the school the young bride attended. So I thought a wine tote would be a good way to repurpose T Shirts. I keep my wine totes (yes, I have more than one but rarely use both….) with my reusable grocery bags. They can also be used to tote a bottle of wine to a party – although it can be awkward if you want to keep your tote! One or two T shirts – depending on the motif size. 1. Cut shirts – Cut shirts to create two rectangles, approximately 7″ x 16″. You have some wiggle room depending on your motif. As you can see, mine is closer to 6 3/4″. 2. 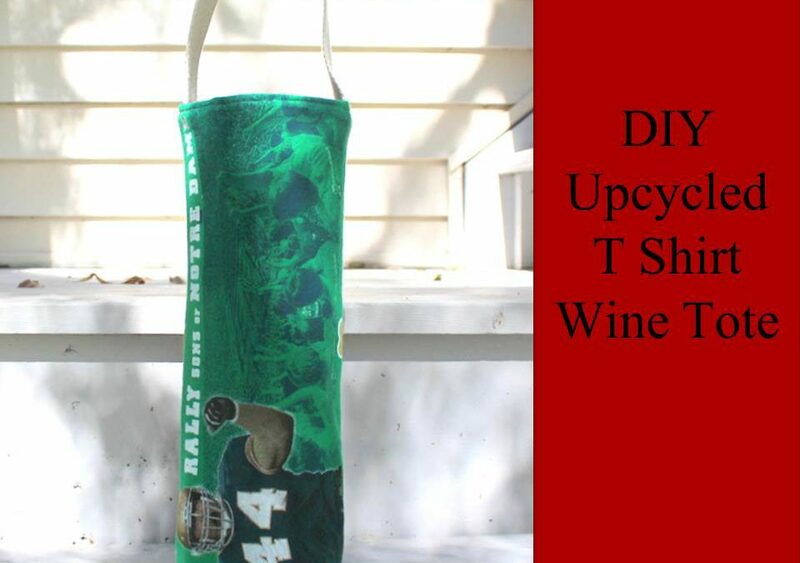 Cut lining – I typically use home dec weight fabrics for my wine totes. I was concerned that the T Shirt material would be weak, so I thought I would add a layer of duck cloth or drop cloth for extra strength. You can either underline each T Shirt rectangle with some cotton or simply create another lining layer as I did here. In addition, I have a lot of scrap polar fleece and sweatshirt fleece in my studio. I felt this fabric would provide a nice cushion for the wine bottle. In hindsight, I don’t think the drop cloth is necessary, so you can certainly try this tote without it. Since I had enough to have a fold in the fabric, I cut both the drop cloth and the sweatshirt fleece to 6 3/4″ x 15 1/2″ with the fabric folded. 3. Sew Shirts together – Place the two T Shirt rectangles right sides together and sew around three sides using a 1/4″ seam allowance. I used a serger. You can use a straight stitch on your regular machine. These won’t be stretching. 4. Sew Linings Together – In the photo above, I placed the fleece on top of the duck cloth. I then folded it up so that the right sides of the fleece were together. Sew on each side to create the bag, using a 1/4″ seam allowance. 5. Sew Boxed Bottom in the Shirts and the Lining – To create a boxed bottom, you have to take the bottom corner of your bag and press it flat along the seam to form a triangle. Mark a stitching line that will be 2 1/2″ across and sew across this line. Cut off excess triangle. Repeat for the T Shirt portion of the bag. The bottom of the bag should look like this. Turn the lining inside out. 6. Cut Webbing – Cut a piece of 1″ webbing to 13″ length. You could also cut strips of T Shirts and braid them to make a handle. Pin (or clip!) the webbing to the right side of the lining centered on each side seam. 7. Sew T Shirts and Lining Together. Slide the lining bag into the T Shirt bag. At this point, right sides should be facing together.Pin the two bags together all the way around the top. Stitch around the top of the bag to close the opening and finish the bag. I hope you enjoy this tutorial! You can find all my tutorials on my Tutorial Page.